BROADFIELD HOSPITAL, PORT GLASGOW Broadfield Hospital comprised two large houses on separate sites, Broadfield (demolished after the Second World War) and, further east, Broadstone Castle. The latter was designed by David Bryce, and was a good example of Bryce’s Baronial mansion houses. 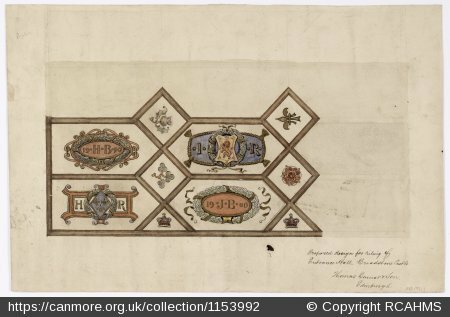 Above is a photograph of the house taken by RCAHMS in 1989, and below is a detail of proposed entrance hall ceiling, with the initials HB, JB and armorial badges, signed ‘Thomas Bonnar & Son, Edinburgh’ 1900. Situated on an elevated site high above the Clyde estuary. It was acquired as a mental institution in the 192os by the Paisley and District Joint Committee, Broadfield became a boys home and Broadstone a home for girls. In 1948 it was transferred to the National Health Service and continued to house the mentally handicapped until the hospital closed in 1985. In 2001 the house was sold and was to be the centrepiece of a housing development (Castle bank), but the house was gutted by fire in 2007. Despite a number of schemes being put forward to restore the building and convert it into flats, in 2014 it remained in a ruinous condition and is on the Register of Buildings at Risk for Scotland. BROADSTONE JUBILEE HOSPITAL, PORT GLASGOW (demolished) The Broadstone Hospital opened in 1907. It was the gift of John and Helen Birkmyre of Broadstone, Kilmacolm, on the occasion of their golden wedding anniversary. Plans for the hospital were drawn up by A. F. Duncan and the first sod was cut on 26 December 1905. The building opened on 24 October 1907. Duncan, the architect, was a local man (the son of Robert Duncan, master shipbuilder), though his practice was in Glasgow. He served his apprenticeship with the Glasgow firm of Clarke and Bell, and worked as a draughtsman for George Bell in the late 1890s while he was engaged on the Port Glasgow Improvement Scheme. It was intended to be for those suffering from non-infectious diseases and for surgical cases primarily for those living in Port Glasgow or near by. Incurable and infectious cases were not to be admitted. It was established as a voluntary hospital, with subscribers able to nominate patients. Only accident cases were to be admitted without a letter of recommendation from a subscriber, countersigned by a medical practitioner who had to certify that the patient was suitable for admission. However, local patients could be admitted without the required recommendation for a weekly fee, paid in advance. Patients were expected to contribute in other ways than merely financial, they might attend other patients, help in housework, needlework or gardening. The white-painted buildings, set on rising ground behind a white painted low wall must have shone out over the neighbourhood – a beacon of health. The site, on the corner of Farquhar Road and Birkmyre Avenue, had been acquired from Sir Michael Hugh Shaw Stewart, and on completion the new hospital was vested in Trustees, ten life trustees who were local landowners, including Shaw Stewart, and industrialists, and ex officio trustees made up of local office holders and the like, such as the provost, chairman of the local school board, the local inspector of the poor. DUNCAN MACPHERSON HOSPITAL, GOUROCK The Duncan Macpherson Hospital opened in 1925 and was designed by Paterson & Stoddart, of Glasgow. It was erected and endowed by the Trustees of Captain Duncan Macpherson of Mavisbank, Ashton, Gourock, with funds bequeathed by him for the purpose. The hospital closed in 1979. The building was still extant in 2011, with only minor alterations to the front, in use by the local authority social work and housing services. It has a two-storey, three-bay centre flanked by low single-storey, three-bay wings, harled with red sandstone dressings. The central bay is gabled, a broad archway marking the entrance, and a pedimented window above bearing a date stone. At the apex of the gable is a chimney, whimsically placed above the window. GATESIDE HOSPITAL, GREENOCK (demolished) Gateside Hospital was originally built as Greenock and District Combination Hospital for infectious diseases by Alexander Cullen of Hamilton. It opened in 1908. Postcard of the combination hospital, Greenock. Possibly the most surprising hospital to find a postcard of, made even more bizarre with the MacGregor tartan and lucky heather. The photograph above shows the matron Miss Margaret Russell Gay, seated to the left of Dr Phillips. She was matron at Gateside for over 25 years, having been appointed when the hospital first opened. From Greenock, she trained at Greenock Royal Infirmary, and before taking up her appointment at Gateside was matron at Largs hospital. She also spent time in America as a private nurse, and was in San Francisco during the 1906 earthquake. She died in 1941 aged about 70. GREENOCK EYE INFIRMARY (Closed by 1982) The eye infirmary was built in 1893 by James B. Stewart with funds donated by Mr Anderson Rodger, a Port Glasgow ship builder. GREENOCK POORHOUSE (demolished) The poorhouse in Captain Street was erected c.1850, after the Poor Law (Scotland) Act of 1845, but was unusual in both the plan of the main poorhouse building and in the inclusion of a separate lunatic asylum. GREENOCK ROYAL INFIRMARY, INVERKIP STREET The foundation stone of the infirmary was laid in 1808. It is the only known building designed by the local harbour engineer John Aird. Before the infirmary was built a dispensary had been established for the sick poor in 1801, but an outbreak of fever in 1806, the source of which was thought to be the crew of a Russian prize-vessel brought into the harbour that year, demonstrated the limitations of the dispensary and the necessity for a hospital. Plans for establishing an infirmary were put in train in 1807, and the building opened 14 June 1809. The dispensary became a part of the new institution. The original building was a good size for the time and the size of the town, providing 32 beds. Sir John Shaw Stewart, Lord of the Manor, gave the site, and the building costs amounted to around £1,815. It operated as a voluntary hospital funded by subscriptions. Additional ground was given in 1815 to provide a larger airing ground. Fever patients continued to be admitted in addition to the usual surgical and medical cases. Outbreaks of fever remained common in this harbour town, and were often severe. In 1829 the hospital was stretched beyond its capacity during an epidemic, resulting in the erection of a temporary fever hospital and plans made to extend the building. Two wings were added in 1830. By the mid-1840s the capacity of the infirmary had been increased to around 100 beds. An extraordinary number for the building depicted in the 1857 OS map (above). INVERCLYDE ROYAL HOSPITAL, GREENOCK The dark, austere tower block that is Inverclyde Hospital opened in 1979. It superseded the Greenock Royal Infirmary, Eye Infirmary, Gateside Hospital, Duncan Macpherson and Broadstone Jubilee Hospitals which were all disposed of by the Health Board in 1982. LARKFIELD HOSPITAL, GREENOCK (demolished) Larkfield Hospital was built as a convalescent home for Greenock Royal Infirmary by Abercrombie & Maitland. It opened on 21 December 1929. At the opening ceremony, a Birmingham-made ceremonial silver key in gold coloured casket was presented to Miss Rankin. The casket was inscribed ‘Larkfield Hospital, Greenock. Presented to Miss Maggie Donald Rankin, by the architects, measurers and contractors’. The key is now in the McLean Museum and Inverclyde Archives. Extract from the 2nd-edition OS map, revised in 1938. Reproduced by permission of the National Library of Scotland. The home provided two, ten‑bed wards and eighteen private rooms. By 1943 it had become an auxiliary hospital treating all medical cases and a new ward was built in 1957 designed by the Nuffield Provincial Hospitals Trust. It closed in 1979. That same year the new Inverclyde Royal Hospital was opened, built just to the north-west. The Larkfield unit for geriatric patients was built on the site. RANKIN MEMORIAL HOSPITAL, GREENOCK (demolished) The Rankin Memorial Hospital opened on 17 August 1938. It replaced the Togo House Maternity Hospital and the children’s hospital at Shaw Place. Miss D. Rankin donated £41,000 to build and equip the new combined hospital. The architect was James Watson Ritchie, for H.M. Office of Works. It was designed as a long low, two‑storey building in three sections with maternity to the west and children to the east of the central administration section. All the blocks were rough‑cast. There was accommodation for 28 women and 28 children, and the 13 1/2-acre site was laid out by Greenock Corporation Parks Department. A ceremonial silver key, made by Hendry & Co. of Birmingham, England, was presented to Miss Rankin on the opening of the hospital by the Burgh of Greenock Corporation. It has been preserved in the McLean Museum and Inverclyde Archives. It is inscribed: ‘Presented to Miss Rankin by the Corporation of Greenock on the occasion of the opening of the Rankin Memorial Hospitals 17th August, 1938′. Miss Rankin having funded the erection of the hospital then handed it over to the Corporation. RAVENSCRAIG HOSPITAL, GREENOCK Designed by John Starforth in 1876 as the Greenock Poorhouse and Parochial Asylum, it was later known as the Smithston Institution. It replaced a succession of buildings which the parish had employed since 1821, including a purpose-built poorhouse and asylum in Captain Street that was barely thirty years old. The large and imposing range of buildings in strong red sandstone were composed in three sections, for lunatics, ordinary paupers and a hospital section. The east front of the hospital, photographed in 2008. The plan is similar to Govan Poorhouse (which became the Southern General Hospital, Glasgow) and Craiglockhart Poorhouse in Edinburgh. The dining‑halls for the asylum section and the poorhouse section were economically designed, back‑to‑back with shared kitchen facilities adjoining. The foundation stone of the new buildings at Smithston was laid in September 1876 by the Earl of Mar and Kellie. It opened in March 1879 and had cost £122,904, to provide accommodation for 750 inmates. There was a considerable public out‑cry at the large sum expended of rate‑payers money. During the Second World War the hospital was requisitioned by the Admiralty and the patients were re‑located to Dykebar, Gartloch, Larbert and Cunninghame Home, Irvine. 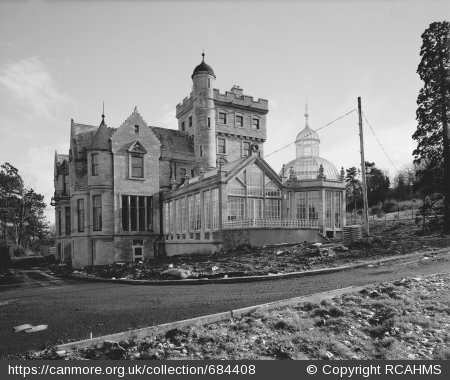 Various additions were made including the occupational therapy department in 1951, an out‑patients’ department and the first day hospital for psychiatric patients in Scotland. TOGO HOUSE MATERNITY HOSPITAL, GREENOCK (Closed 1938) Togo House was presented to the burgh of Greenock in 1917 by Baillie Daniel Orr for use as a maternity hospital. It was extended in 1926 but in 1938 it was replaced by the purpose‑built Rankin Memorial Hospital.